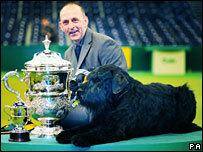 A giant schnauzer called Philippe has been named best in show at the annual Crufts dog event. Judge Clare Coxall said the pedigree, who has made it to the finals twice before, had "sold himself to her". Owner Kevin Cullen, of St Leonards, East Sussex, said his dog had never let him down. "I cannot believe it. It means the world to me," he said. Organisers said a record 160,000 people had attended the four-day event, now in its 117th year, at Birmingham's NEC. Second place in best in show went to Hermioni, a samoyed, who had won the pastoral group category. She is owned by Lisa Bobrowski, from Woking in Surrey. Asked about her final decision to give the title to Philippe, Mrs Coxall said: "He came out from that arch and he came in and he just looked as if he owned it. "So did the sami (samoyed) but when I had my hands on him (Philippe) he had muscle on top of muscle. Last year, a Tibetan terrier called Araki Fabulous Willy was named best in show.